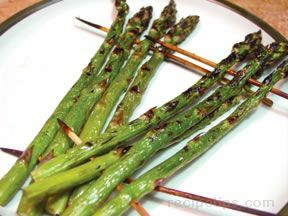 Asparagus is the perfect vegetable on the grill. The flavor the grill adds to the tender spears is sensational. Combine that with the marinade, this vegetable is perfect. Combine ingredients in a zipper bag; seal and marinate at least 30 minutes. 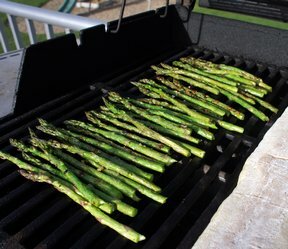 Remove asparagus from bag and place on grill coated with cooking spray. Grill 5 minutes on each side. Sprinkle with Parmesan cheese and cook for additional 3-5 minutes. NOTE: To bake in the oven, place asparagus on baking sheet coated with cooking spray. Bake at 400Â° for 12-15 minutes. 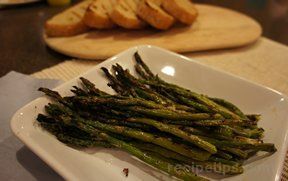 "I found some asparagus at the store that was thin and looked good, so I tried this recipe with it. 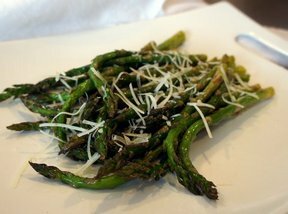 The marinade added just the right richness to the asparagus."